Ever wonder how you’ll come back in your next life? I sometimes think that I, this over-wrought ever-apologizing caricature of delicate feelings and political correctness, might come back as Kenny Friggin’ Powers from Eastbound and Down. That cured me for decades. I hope you can view this YouTube video on your device, so you can see what I’m getting at here. This is a kind of dream sequence from Eastbound and Down with main character Kenny Powers who refers to himself in the third person with a form of the ‘f word’ for a middle name. Besides being the only clip I could find without swearing in it, it’s also a perfect illustration of one of the key elements of comedy, which is juxtaposition. Here’s this rough, egocentric former ball player now cut from the roster and trying to make a life back in his hometown as a sort of teacher’s aide at the middle school. What’s funny is the contrast between his adult cynicism and the sweetness of these pint-sized children. This might even be the very first episode of the first season of the show which is now halfway through its third and very last season. Actor Danny McBride has done some very good straight roles too, as when he played the temporarily reluctant bridegroom with George Clooney in Up in the Air. 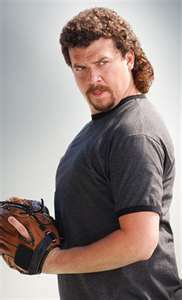 I guess all I’m saying is we won’t have Kenny Friggin Powers around much longer. Take off the white gloves, set down that teacup for a bit and see what you think. For the the R-rated more accurate version you can just go right to YouTube and click on almost any other scene. I don’t know why you watch that? I’m on old Daves side on this one. Can’t stand all that f……ING language. I would like to see a show where they come up with a different word every time they want to express themselves with the f word. That I could watch. I have used the word but only when I’m really mad like referring to Rush Limbaugh. In real life I don’t like that word at all – but say away from this show unless you want ti get really upset: the language is the least of it!